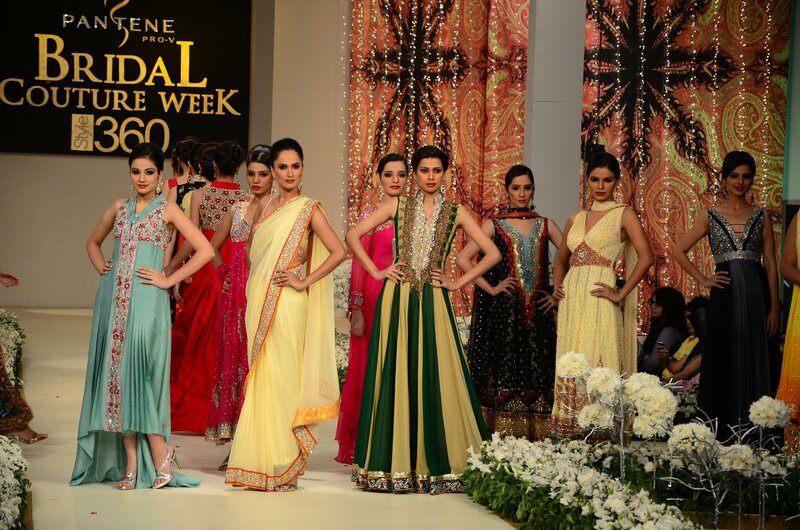 Pantene Bridal Couture Week which was held in Karachi and will be ended on 17th April. The Day 2 of that fashion week was as rocking as the day 1. Hasan Rizvi, Fahad Mustafa, Saba and Misbah, Shamaeel Ansari, Saim Ali, Rabbani Rakha and many more fashion designers showcased their dresses and earned huge appreciation from the audience. On the day 2 of Pantene Bridal Coutre Week new stylish dresses for both men and women were included. In Women Wear Anarkali Frocks, Gharara, Anghrakha, Lehngas was included and all the dresses were heavily embellished with embroidery and in Men Wear Kurta, Sherwani And Mughal Pajamas was included. 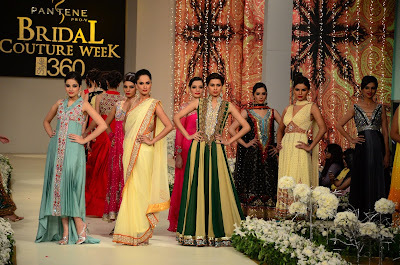 Here are some images of day 2 of the Pantene Bridal Couture Week 2012 have a look girls and guys. At the finale of the Pantene Bridal Couture Week (PBCW) 2012, Pakistan’s premiere event for bridal wear, if there was anything worth waiting for, it was the tribute to some of the most prominent designers of the industry. The special cameo display, which marked the end of the three-day event, showcased an array of the designers’ best works and achievements. Out of a total of 14 designers creations that were presented, we chose the best five outfits, details of which are given below. In a completely different take, Sayeed wowed the audience with the Rajasthani-Lahariya dupatta that he used for his bridal outfit. 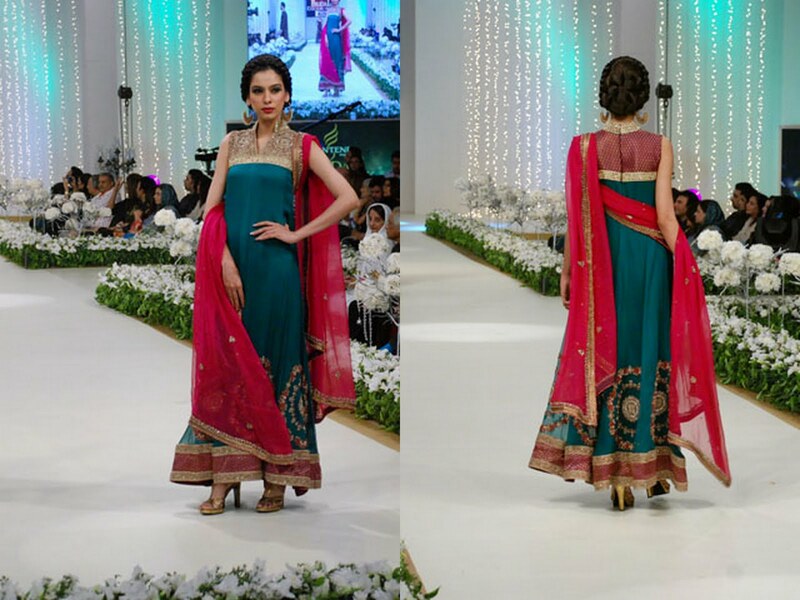 Additionally, his creative use of peacocks on the pink border of the farshi gharara, proved how well thought-out his designs are. The cotton wire work on the shirt and sequined work on the multi-coloured dupatta are the cherries on top of an already rich cake. You can get more latest updates and information about fashion, beauty and life Style from FASHION LIFE MAGAZINE It also features Indian fashion, wedding, clothes and bridal wear. You will find everything from fashion to designer accessories.Fashion Life online magazine is dedicated to the news updates and empowered Indian woman providing information about women's potential through self-esteem, dignity, inner beauty, relationships and self improvement and woman interests.